If you have been handed over the turkey roasting this year and are nervous or have had more misses that hits, then let’s talk turkey! No need to stress over this, really. The key here is good notes and understanding technique. I’ve jotted down a bunch of notes to make roasting turkey easy. Speaking of easy, there’s no basting. Yes, really. NO BASTING. 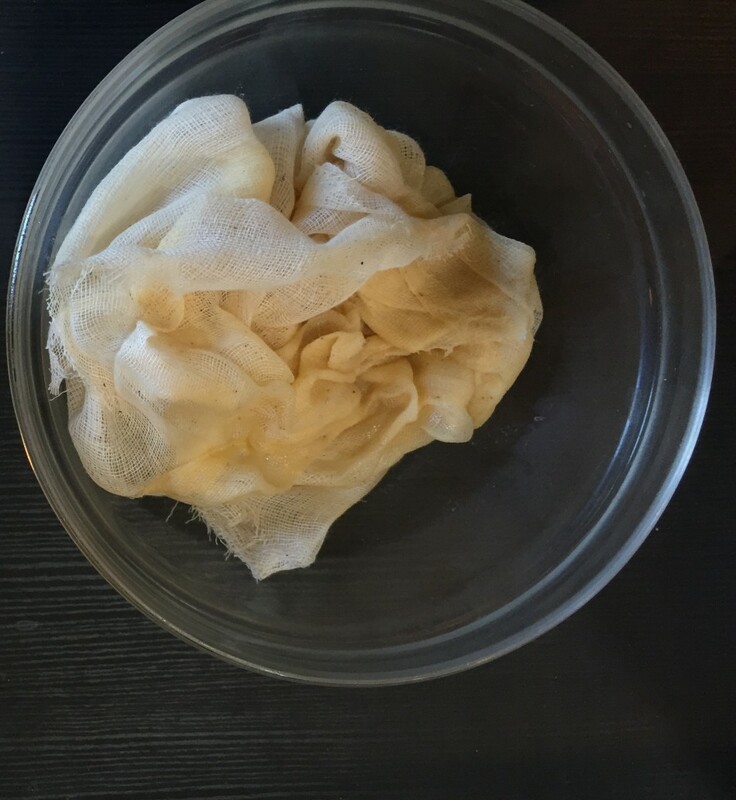 The greased cheesecloth prevents the juices from evaporating while keeping the skin moist – my savior for foolproof turkey. This is my new thing … bye, bye hot-oven-air-in-my-face-every-20-minutes basting. My first turkey was golden brown and seemingly perfect. I may have basted it a dozen times out of worry. Then when my husband carved into it (meaning immediately, per my not experienced instructions) all the juices ran out and it was sadly dry all over by the time we sat down to eat. It was also very dry in the thigh meat because little did I know and roasted it with thigh side up. Not a very good turkey back then (more like so horrible that we feasted on all the thankfully tasty sides and dessert), but after testing (many) different methods this yields the best results and most flavor. As you know, I’m usually itching to put a twist on the traditional, but with turkey and gravy, I like to keep it simple. Not much changes with it every year other than little tweaks to simplify the process. The gravy is so simple and doesn’t taste heavy like gravy can sometimes. It comes together in minutes and heats well while getting everything else ready. We love it on stuffing too. Last year’s turkey was a combination of fresh and dried herbs. This year I’m going with all fresh herbs. The best tweak, since, is the cheesecloth. I’ve roasted a few this way (I’m not the only one who buys a few to keep in the freezer, right??!?) with perfectly cooked results. But before we add the cheesecloth, it’s crucial to dry the turkey, inside and out, to get a crispy skin. I find the pat-with-paper-towels method ineffective, instead, I turn it upright over the sink to drain excess liquid then transfer it into the roasting pan to air out on the kitchen counter while I tend to other things. I find the pat-with-paper-towels method ineffective, instead, I turn it upright over the sink to drain excess liquid then transfer it to the roasting pan to air out while on the kitchen counter. I make the seasoning rub, tend to other things, and when the skin appears dry I season it. While the turkey sits out it helps take the chill out, important for two reasons: a) if the turkey is too cold the skin may tear when seasoning (under the skin) and b) it will cook unevenly and likely near raw near the bones. Many brine their bird swearing it makes the best turkey; I boldly tried brining (two 14-pound turkeys) one year to see what the fuss was about and while it was moist, it wasn’t any more ‘moist’ than a seasoning rub the day before but it did take up most of the room in my second fridge while it sat in my enormous soup pot (We had to remove a shelf. Can’t imagine doing this with one fridge!) forcing me to do more day-of cooking. Stuck in the kitchen like a hot (stressed-out) mess is no way to celebrate Thanksgiving. 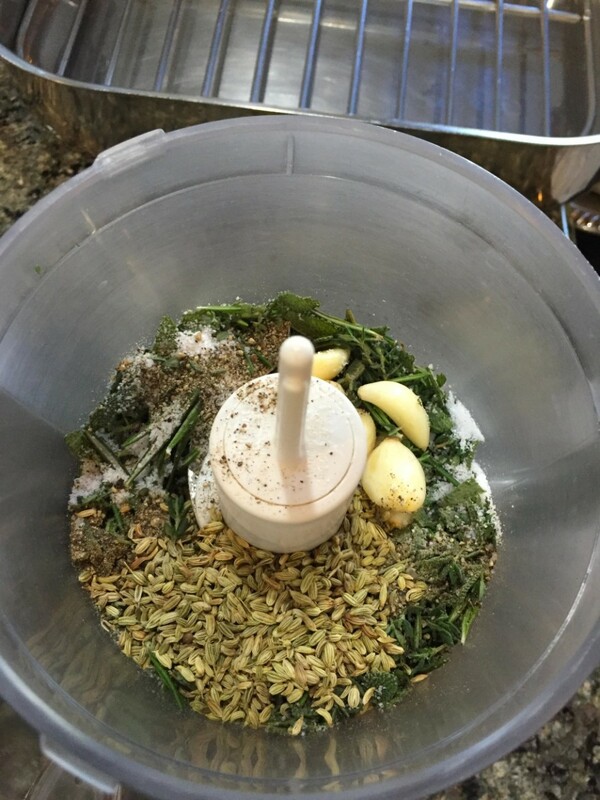 Another note, fresh herbs have a milder flavor than dried herbs (especially ground sage), which I prefer given all the different foods on the table – still very flavorful yet not overpowering. 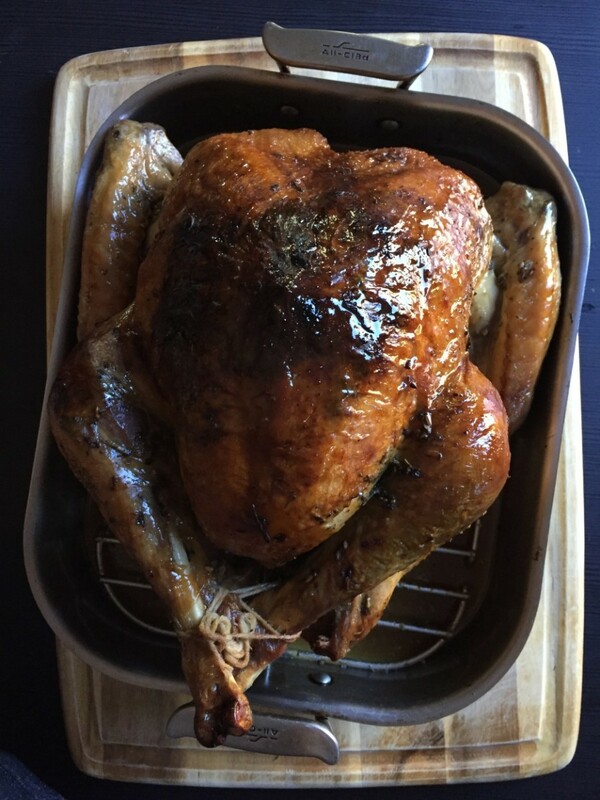 It’s moist on the inside, yet crispy on the outside, with a seasoned herb mixture in between … a combination I think your guests will be thankful for and easy enough to have you enjoy roasting turkey year after year. And…for some stuffing recipes from last year try cornbread stuffing with chorizo, or a lighter, meat-free mushroom leek stuffing. Also, some sides like sweet potato casserole, brussels sprouts. For some dessert ideas … no-bake pumpkin cheesecake if you don’t feel like baking and if you do feel like baking how about apple pie or apple pie spice cupcakes, or a pumpkin bundt cake … find more recipe in the archives if planning ahead or stick around…I have some desserts coming this week! 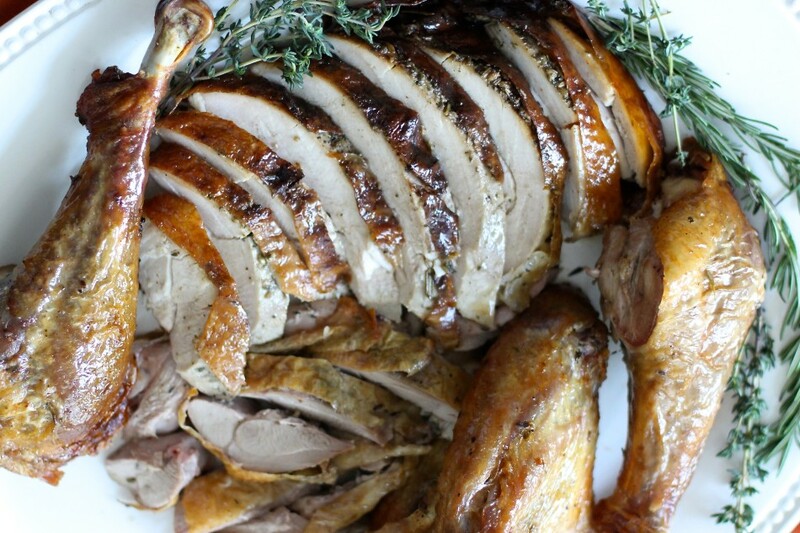 Foolproof roasted herb turkey that is moist and full of herb flavors! Many notes and tips below for successful roasting and homemade gravy. Note: You will need a roasting rack and an unbleached cheesecloth (folded 2-ply and large enough to cover the turkey). *If frozen, it requires 3 days to defrost in the refrigerator. *Please read notes below before beginning to yield best results. * COOK TIME includes resting meat. Preheat the oven temperature to 425 degrees F (218 degrees Celsius) with the oven rack placed in the lower part of the oven. In a mini food processor, pulse all the fresh herbs, 4 tablespoons kosher salt (3 teaspoons set aside), black pepper, 4 tablespoons non-dairy spread, lemon juice, olive oil and garlic until herbs are well minced. Place your turkey in a roasting pan, set on its’ rack. Doesn’t matter which way now since we are seasoning. Wearing latex-free gloves (to prevent ruining your nails! ), rub the seasoning mixture under the skin and the inside cavity. To do so, gently detach the skin from the meat with your fingers (not nails) then grab a heaping handful of herb mixture then push your way under the skin, rubbing herb mixture as you go. Repeat until both sides of the turkey is seasoned. To prevent ripping the wings, gently push only under the wings where it’s attached to the breast. Don’t force it, otherwise the skin may tear. Note: This step does take a little time, so give yourself 20-30 minutes to season. Music in the background is always nice. When fully seasoned, set turkey breast side up. Gently twist the wing tip (the first joint of the wing) and push it under the thigh. You may need to give it a bit of a push as it can be resistant. Then push the drumsticks together, one on top of the other, and truss, or tie with twine (sold in supermarkets or cooking supply shops) by looping in between (drumsticks) then under, and over several times — kind of like making a figure eight out of twine, securing the drumsticks securely (this helps prevent too much air circulation, which can result in a dry turkey). Pull the neck skin to cover the meat, then melt remaining 3 tablespoons non-dairy butter and submerge cheesecloth to fully coat and cover the turkey completely. Cook at 425 degrees F for 1 hour then reduce the heat to 325 degrees F for 90 minutes. The cheesecloth will be dark and very dry, clinging to the skin. Be careful not to pull the cloth off quickly, it's hot and may also tear the skin. Do not carve into the turkey to test for doneness, it will dry out the turkey. Note on doneness: poke an instant-read thermometer somewhere between the leg and thigh (do not touch the bone or it will not read accurately), when it reaches 160 degrees F it's ready. To easily separate: spoon some hot fat drippings over the cheesecloth then gently lift it off. Spoon more fat as needed until completely off. You should have dark, amber looking crispy skin underneath. Turkey temperature will continue to rise another 5-10 degrees while the turkey rests and reach the optimal 165 F temperature. Transfer turkey to a carving board and loosely cover with aluminum foil, let rest for 20-30 minutes before carving. Meanwhile, prepare gravy. FOR THE GRAVY: (Updated 11/25/16) Set your roasting pan, containing strained drippings, directly over medium-high heat. When it comes up to a boil, add tapioca (evenly across the drippings) and whisk continuously for a minute or two until it begins to thicken. Transfer into a heat-safe bowl and bring to a smooth consistency using a hand-held immersion blender. This will remove any stubborn lumps and thicken it even more. I originally combined water with tapioca starch then added the slurry to the fat drippings. This year I added more starch, without the water and immersed it right in the roasting pan. I don't recommend that, though, better to transfer it since the hot gravy can splatter! Using the immersion blender created a smoother gravy in less than a minute, instead of the laborious whisking for 5 minutes. Keep an oven thermometer in the oven. I have one in both of my ovens to ensure the temperature is accurate before cooking or baking. The temperature the oven says or beeps at when it’s ready is never accurate! 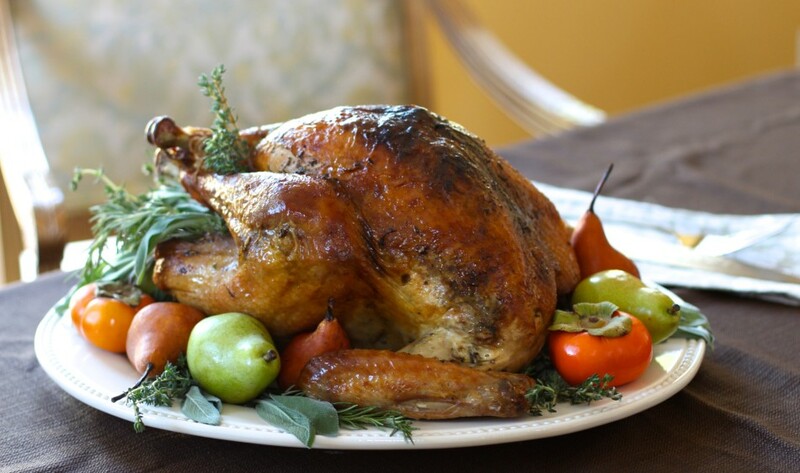 Remember to allocate enough time for seasoning, roasting, AND resting the turkey - about 3½ to 4 hours. Turkey should be close to room temperature. Roasting a turkey straight out of the fridge (or still very cold) will NOT roast evenly, instead keep it out at room temperature for an hour before seasoning. Make sure to remove the plastic that secures the cavity to the drumsticks before roasting. No need to baste your turkey! I used to roast the turkey breast side down to allow the fat from the dark meat to drip down and baste a few times, but now follow this method (cover with greased cheesecloth) that I learned from my uncle. 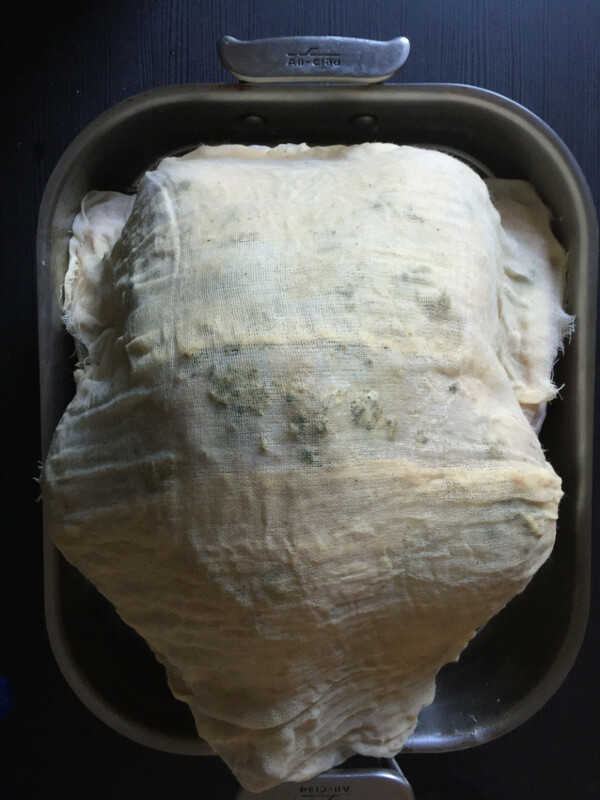 The cheesecloth makes roasting turkey foolproof - it will do all the work until the very end. Basting while the oven remains open lowers the oven temperature, this can affect the roasting time and yield inconsistent results depending on how many times the oven was opened. You can season the turkey the day before, cover and refrigerate. Bring it to room temperature (at least an hour) before roasting. For a larger crowd: try roasting two smaller turkeys rather than one big one to give your guests more drumsticks and thighs. Average 12-pound turkeys will need 45 minutes at 425 F then 70 minutes at 325 F.
If you are buying a turkey that has been brined then omit the salt, and just sprinkle a little evenly on the skin. If you like to roast the neck and giblets, place somewhere inside roasting pan, not inside the turkey. It should also be covered with cheesecloth. Defrost a frozen turkey 24 hours per 5 pounds. A 15-pound turkey needs 3 days in the refrigerator, so figure Sunday before Thanksgiving as the last day to buy a frozen turkey. Many recipes state to roast turkey at 350 degrees for 30 minutes per pound; I find this dries out the turkey and does not yield a crispy skin (as I learned from experience). For me, it would yield perfect dark meat and dry white meat, not a winning combination for guests! So I threw that method out and have been roasting it this way since. Another thing I don’t do: stuff the turkey! I did this one year (think it was 2004, the year the twins were born) thinking the turkey juices will take my stuffing to a whole new level, instead I got soggy stuffing and a turkey that wasn’t cooked in the center because it was stuffed. I had to cut it up and serve it in its' juice as "turkey au jus" - another method out the window! For the gravy: in prior years I have found that tapioca starch makes the gravy too gummy. The best is cornstarch. If you are corn-free, try potato starch (not flour) for great results. Turkey looks beautiful with the fruit around it. Lots of great tips Jessica, thank you! I have had the open oven air in my face too many time lol and it always smears my makeup! Will be trying your cheesecloth method this year. Ha! Enough is enough with hot oven air! Cheers Jenna! Thank you for all the great information, your turkey looks wonderful. I always make honey glazed turkey, do you think covering with cheesecloth will make it stick too much? I don't like basting and would like to try this. Thank you. 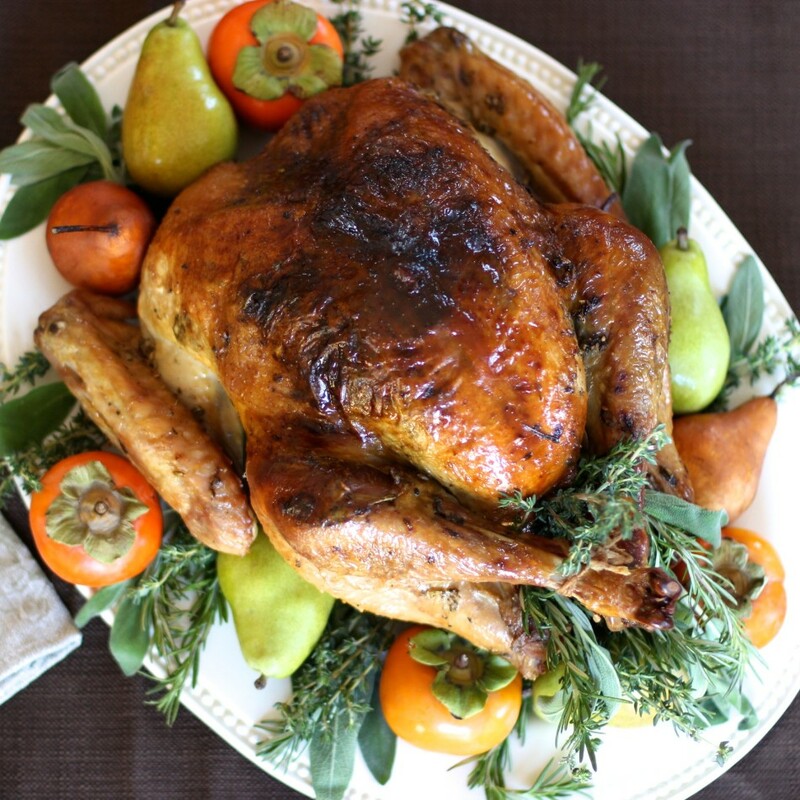 Turkey looks very pretty with fruit and herbs you decorated with. The recipe sounds delicious. Now I don't feel so nervous making turkey with all your notes. Thank you! As I'm reading your tips and notes I'm saying to myself " so that's why!" I admire how you explain why you do what you, and love your recipes. Thanks for all these helpful tips and recipe! Your turkey looks delicious. I'm a cheesecloth believer!! Gorgeous turkey! I've never made a turkey and have taken the reign this year, your notes will come in handy for sure!! Yay for taking on reign! Glad to hear it will come in handy. Let me know how it goes! Cheesecloth huh, clever. Your farewell to oven air in your face had me in tears...so very true! Great tips Jessica, thanks! Hi Erica, Seasoning will need some adjusting; my suggestion would be to add 1 additional teaspoon of kosher salt PER POUND of extra meat, a few extra pinches of each herb, 2-3 additional tablespoons of fat (non-dairy butter) depending on how lean your turkey looks (heirlooms are leaner than say a conventional turkey) and additional squeeze of lemon. Roast an additional 30 minutes. Then check the internal temperature per recipe. If it hasn't reached the optimal temperature then roast an additional 5 minutes, or more if needed in 5-minute increments, until you reach 160 degrees F. As noted in the recipe, it will continue to cook while resting. Hope that helps! Do you recommend my taking on the green been casserole in addition to a turkey? As a side dish? Sure! Green beans are fairly quick; the lemon aioli and breadcrumbs can be made in advance. Enjoy! I'm going to try the cheesecloth method this year and I'm soooooo excited about it! WOOHOO for no basting! 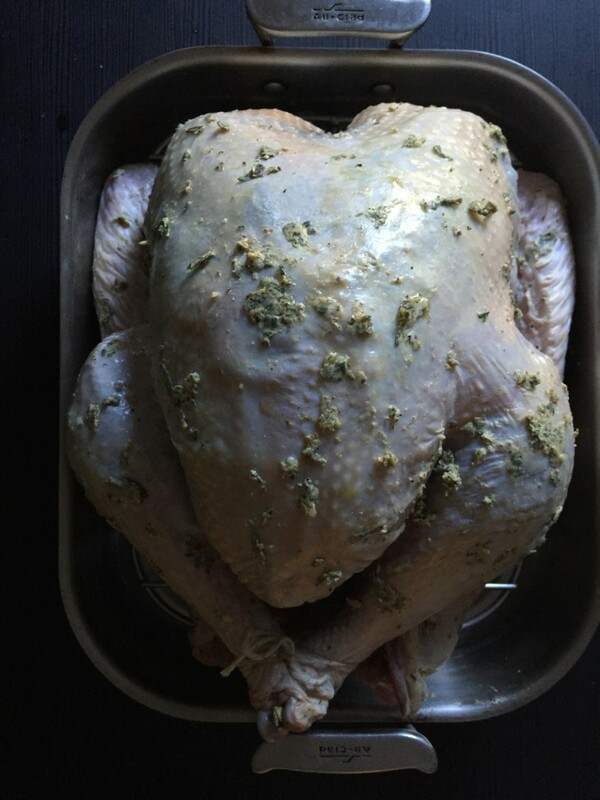 Question: have you ever stuffed a turkey with gluten-free stuffing? I've always done mine out of the bird and was considering trying it inside this year, but I'm so nervous it's going to get too soggy! The cheesecloth makes things so much easier! I have and don't suggest it. AT ALL! I used cornbread in my stuffing and it got so soggy like cereal in milk soggy; so then I tried it again around Christmas using xanthan gum and it came out soggy again but also gummy. Both times I had to send my husband running to the store for more ingredients to whip up another stuffing last-minute! Since then I bake the stuffing separately while the turkey is resting if I don't make it ahead and freeze it. Hope that helps!! My Mom covers her turkey with cheesecloth too, its the best. Will be trying the herb mixture and your method this year, my first! I use coconut oil for everything can I use it instead of earth balance and oil??? Thanks Jessica! First turkey cheer!! My only concern about coconut oil is will it bind all the herb seasoning ingredients. If the coconut oil is not a liquid consistency then yes it should be fine. For the cheesecloth, you will need to melt it before dunking in the cheesecloth. Good Luck Rachel! Great tips here. 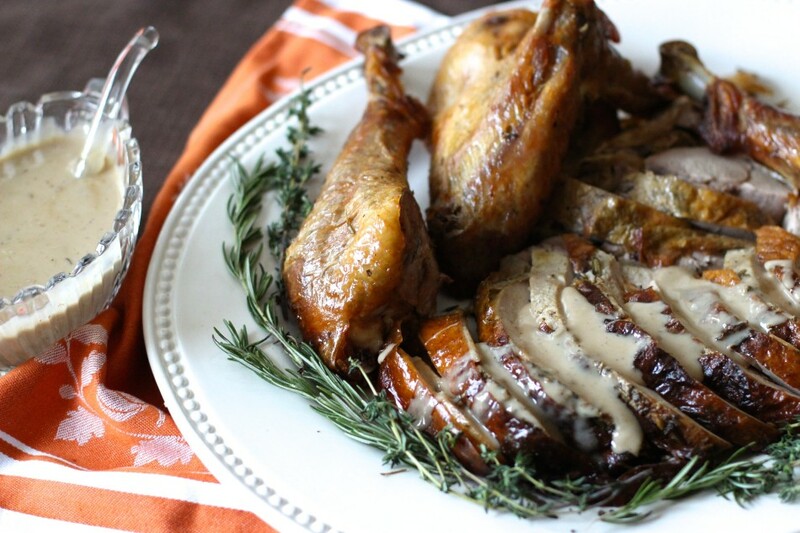 I'm definitely going to try cheesecloth way, your turkey looks delicious! You are going to love the results! Let me know how you like it...enjoy! My heirloom turkey came out divine, everyone loved it!! Wanted to say thank you for your tips and using cheesecloth is now the only way I will roast turkey!! I'm putting the ingredients together for the herb seasoning and I think that I need to add lemon juice since that is one of the ingredients. Where do I add the lemons? Oops, sorry about that Jerry! Add it in with the other ingredients, all at once. Can you help me adapt this recipe a little? I only have dried herbs (just moved have limited kitchen gear). And my roasting pan has a temperature limit of 400 degrees. My Turkey is a 13.38lb turkey. How long to roast at 400 and then how long for 325?